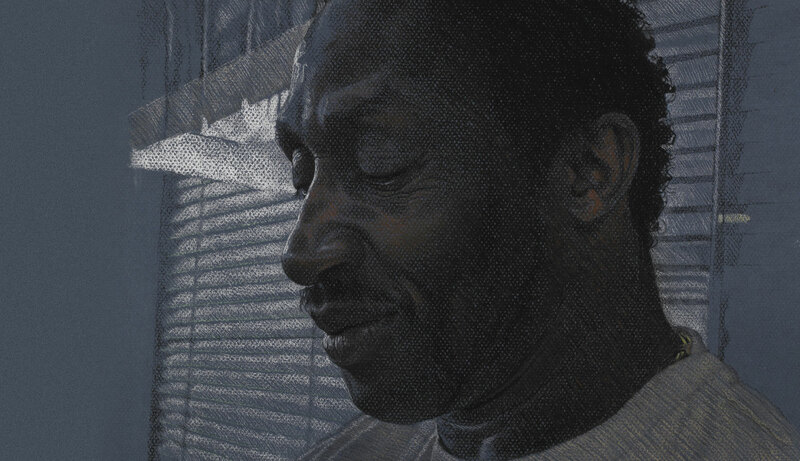 This is a portrait study of the UK Olympic athlete Linford Christie, showing him during a break when he was training top athletes at the indoor sports arena at Brunel University, England. Phillip Butah spent time shadowing him and sketching him during the day, and then produced this picture back in his studio. The artist told me that his aim in this drawing was to capture both his admiration for one of his childhood heroes, and a hint of sadness at the human inevitability of sportsmen past their prime. The artist shows the athlete older and wiser, perhaps reflecting on his past and his future. Phillip Butah also mentioned to me how good it was to see someone like Christie passing on his knowledge and expertise to young athletes. Interestingly, there is no reference to Christie’s sporting background in the picture – just the drawn blinds of an office window and some suspended lighting. The artist is not interested in reputation or the trappings of position and status. This is a more a picture about experience and a perceptive study of a thinking, feeling human being. There is no adulation, but rather a wise understanding.